This is the last elevation chart made by Zdenek because he ended his hike at Mt Robson last year. 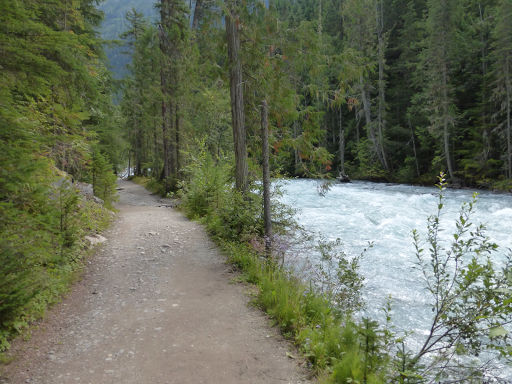 Note that today’s hike is reversed from yesterday, so start right to left as we hiked back up to Robson Pass. Note: I’ve had a few people ask about GDTer Ted, who was airlifted out last leg. I forgot to update everyone, but I did talk to him while I was in Jasper. Turns out that while going down the valley after Cataract Pass, Ted somehow got a long gash near his knee. He isn’t sure what happened and just realized he had the large cut. 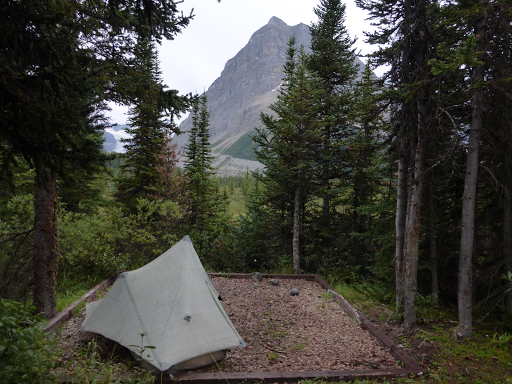 He pitched his tent soon after and was able to communicate with family and local emergency services by using his Delorme InReach device which enables texting from almost anywhere. By morning, he decided he shouldn’t hike on the leg and a helicopter came to get him. He required many stitches and all else was good. That was unfortunately the end of Ted’s hike. I slept in and it was just what I needed. 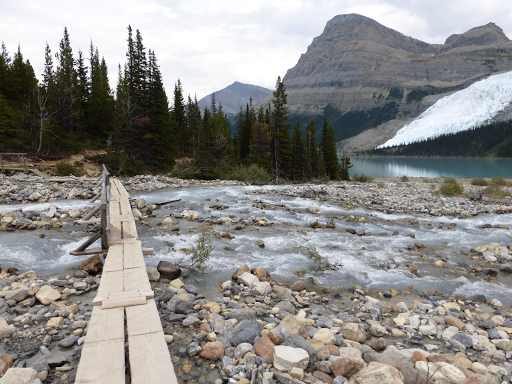 We had a half day of hiking to do back up the Berg Lake Trail towards the GDT, so there was no rush. All is hikers tended to our town needs and we saw each other on and off. We took advantage of the complimentary warm showers at the campsite. The last showers for E and myself until we finish in 9 days. I got in early at 6:30am to make sure it was a warm one. Then I returned to the tent to catch up on blogging for an hour or so until the visitors center opened again so I could use their wifi. When I woke up this morning, my foot itched quite a bit and I figured it was due to muddy socks and needing to wash them real good. Then after I showered, I noticed it was quite swollen. Yesterday at the visitors center I noticed I had a blood spot on my ankle like a small cut or bite. It appears something bit me and I’m having a reaction. All this time in the wilderness and something gets me at the visitors center while I was wearing flip flops! You can see the small bite in the photo. 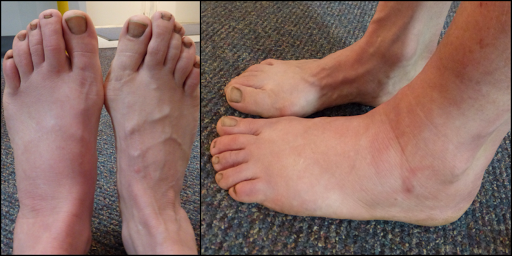 Not a good thing to have swollen the day I leave for a 9 day leg…It didn’t hurt and just felt tight and swollen, so I decided to hike on it and hoped the movement would get the blood flowing and move out whatever I was reacting to. Now it really does look like a hobbit foot! The wifi wasn’t very strong and many tourists were around using it too, so I could only get one more blog up and it took 30mins to load. The others just kept crashing, and I couldn’t get them posted before I left. I was pretty stressed because I also had some technical difficulties with the app I use with the Eye-Fi card and the fact that I’m cheap and got low memory on my phone. Every so often, I need to delete and reload apps if they take up too much memory. Long story short, Eye-Fi may not be the wifi as card I’d recommend because their newer cards seem to require a paid account to use them to store photos. I can get around it with an old card, but not sure you can with the new ones. I spent a ton of time on slow wifi having to figure this out and that’s what most of my morning was spent on…blog stuff. I’m greatly looking forward to returning to my daily life where I don’t blog every night and just skip straight to the TV! E and I headed out on our own scheduled knowing we had a reserved site. I was about 45mins behind E by the time I left the trailhead at 12:50pm. The hike was the same as yesterday, but uphill this time and with 9 days of food, whew! I kept a good pace and didn’t stop for fear that my foot might swell even more. I felt the tightness, but no pain. Here are some shots from today. I know I already had a bunch yesterday. Here is the wide trial at the beginning with Robson River along it. Yesterday, I took the high route looking down on Berg Lake. Today, I took the regular route with periodic views of Berg Lake. Now that I’ve done both routes, I’d say it’s a matter of preference. 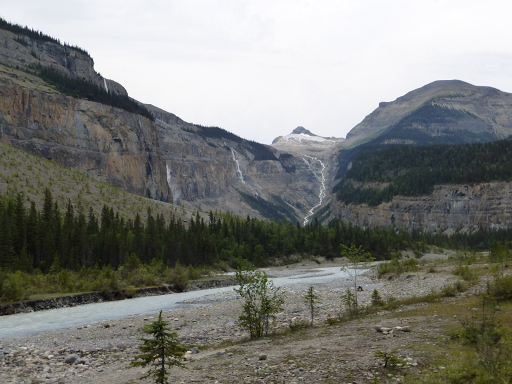 The high route (I recommend just from Robson Pass to Tobaggan Falls) had more solitude and an aerial view, but more strenuous. The low route had some woods and periodic ground level views of things. 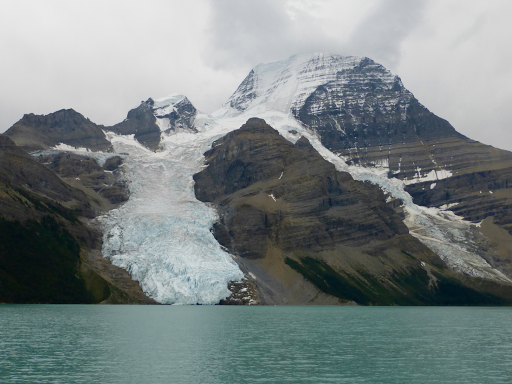 Here’s L to R, Mt Waffl, The Helmet, Berg Glacier, and Mt Robson. 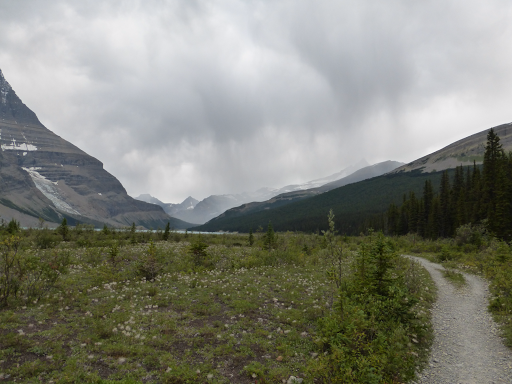 As I got within an hour or less of camp, I looked back and saw rain was moving in. Argh! We knew it would rain tomorrow, but didn’t expect today! I booked it to try to get my tent up before it rained. I made it to the campground as the rain started to fall and E was pitching her tent. It was almost 5:30pm, so I made dinner under a thankfully protected eating area while I waited for it to stop raining. There were lots of other campers there. Luckily, it did stop raining after I finished dinner and I set off to set up camp around 6:45pm. All the protected sites near E were taken, but I knew of some lesser known sites by a stream about 100yds away. It was worth it in case it rained overnight to get a protected site. I have this whole area to myself, a running stream next to me, and a view of Mt Rearguard.